The fabled football match of Christmas 1914 might never have happened, but there were certainly truces between British troops and the German units they faced. Often they began with competitive carol-singing, followed by shouted greetings and festive wishes. In places, men even met in no-man’s land and swapped small gifts and souvenirs. 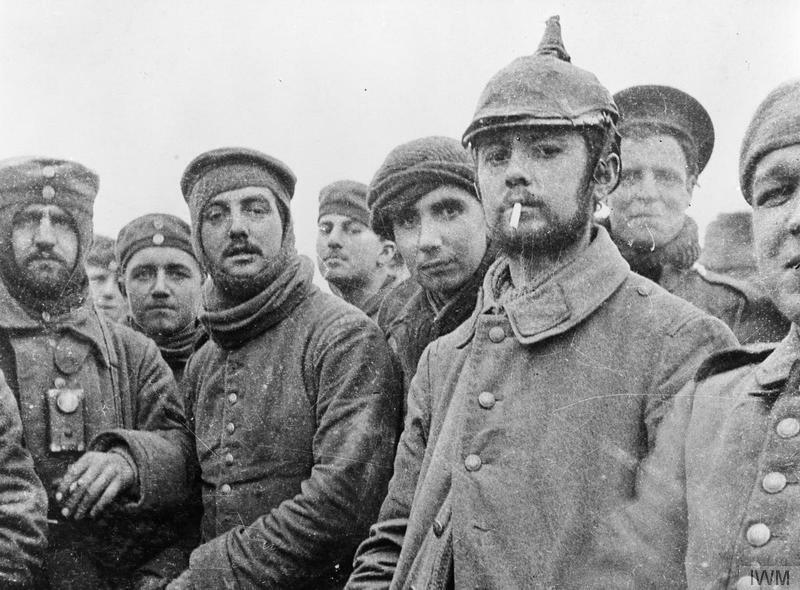 Image © IWM (Q 11745) – British and German soldiers fraternising at Ploegsteert, Belgium, on Christmas Day 1914. Possibly Riflemen Andrew (middle) and Grigg (second from the right, background) of the London Rifle Brigade with troops of the 104th and 106th Saxon Regiments. About 3 o’clock the Germans, who had since the morning been shouting and singing in their trenches, made signs to our trenches that they wished to communicate with us, and eventually they began to climb out of their trenches. We did the same, as did also the regiments on our right and left. Both sides fraternised for about an hour, several Germans coming over to our trench and talking and conversing by signs with officers and men. They gave our men tobacco cigarettes and newspapers, and for about an hour both sides walked about freely outside their trenches and in the open space between the 2 lines. This moment of peace was not without its reminders of the violence and bloodshed which had preceded it. The Garhwalis took the opportunity to search for the bodies of the officers and men missing after a night attack made the month before. Captain Burton found Captain Robertson Glasgow’s body lying on the parapet of the enemy’s trench. The bodies of several men were also found near the trench, but the situation did not admit of a careful search sufficient to identify them. Considerable sniping, and lit up by star shells during early morning. …truce came to an abrupt end, sniping resumed. “Presumption is that our “friendly” enemy of the last fortnight has been relieved. Image © IWM (Q 51524) – Sergeant Major Malins and 2nd Lieutenant Nicholl of the 1st Battalion, Cameronians (Scottish Rifles) checking for snipers from ‘Cabbage Patch Trench’ in the Rouges Bancs – La Boutillerie sector of the front line, 5 November 1914. By Christmas 1915 there were signs that the British attitude to the enemy had hardened. Perhaps the dire warnings from on high had had the desired effect, or maybe by then the men had suffered too much to be able to set it aside. Either way, the 1/16th London Regiment (Queen’s Westminster Rifles) reported that there was no repeat of the previous year’s truce. The Germans shouted across to our men this morning, but recieving no encouragement the conversation ceased. [A shell] hit the corner of [a] dug-out and knocked a bottle of whisky off the table on to the floor, but by the grace of God it did not break. There are already signs that the enemy intends to fraternise during Christmas as he did in the winter of 1914 and 1915. An artillery and trench mortar bombardment was ordered to prevent this. 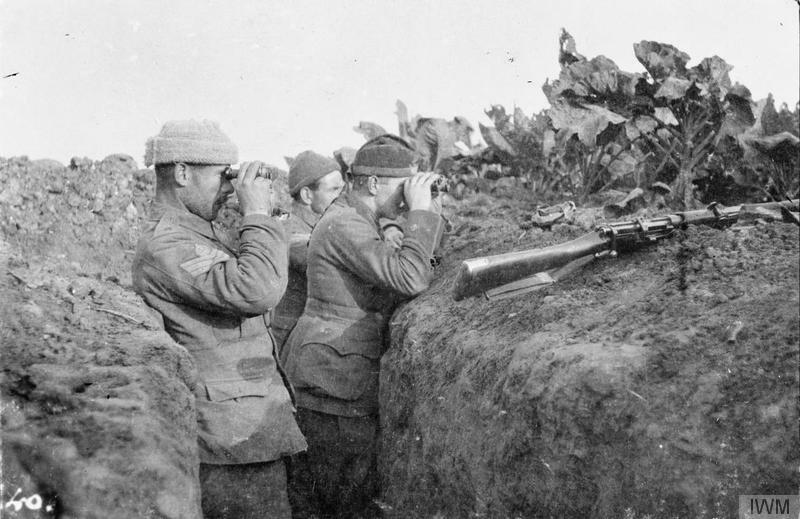 Commanders feared that it would be very difficult for young and inexperienced officers and NCOs to stop their men going out to meet the enemy if they were seen to leave their trenches in peaceable fashion. Sadly, the widespread coming together of opposing units during the winter of 1914 was an anomaly, a brief respite before the full, brutal horrors of trench warfare became the norm. Yet in that moment, we see the spark of humanity which binds us all together, the ability to find common ground in even the darkest of places. Who knows what friendships could have sprung from those handshakes made 100 years ago, how different things might have been if the two sides had not returned to their lines. Perhaps that would have been the greatest Christmas gift of all. Thanks for giving qualified diary reports which help put the Christmas truces in perspective. They happened in places but definitely not across the whole Front. The soccer match(es) may have happened in a few places (or even in one place) but the story has now become mythologized for popular consumption. Thanks, Patrick. From what I understand, most soccer matches were between men of the same nation, although there is an account from the Lancashire Fusiliers of a game developing between them and the Germans using a can of bully beef as the ball. Two of our war diaries from The Rifle Brigade show participation in the 1914 Christmas Truce. One battalion took advantage of the truce to mend wire fences.